The Bali Santi Range smells like a far-off tropical paradise, it has smoothing sweet almond oil, nourishing coconut oil which are sweet and evokes memories of holidays. So this range makes you feel like you’ve jetted off somewhere warm, which let’s face it in the depths of a British Winter is always the dream. This is a really nice indulgent bath product, I like that it is an oil it feels so grown up and luxurious. I found the scent of this so relaxing and I felt like I was in a tropical holiday destination. The oil leaves your skin feeling so healthy and soft but not greasy, you don’t need to add much to your bath and I don’t like using it in the shower because it does leave it quite slippy & I am VERY clumsy so I use this as a bath oil and its perfect. I have to say I haven’t used many body milks in my time but this one feels so cooling and soothing on the skin and it is much more lightweight than the body butter. I have been using the milk as my morning body moisturiser and then using the more heavy body butter in the evening and that has been working wonders for my skin. This feels very gentle and the scent is beautiful and a really pretty mix of sweet, spice and floral scents. This is your standard thick deeply hydrating body butter, its is packed full of lovely ingredients including moisturising shea, cocoa and mango butters, soothing sweet almond oil, nourishing coconut oil, soothing frangipani flower milk, fragrant orange and ylang-ylang. It might smell quite fresh and summery but this is a perfect Winter skin saviour, it’s so nourishing and keeps my body smooth and soft. I love using it in the evening after I’ve had a bath because I go to bed not only smelling so good but I wake up with incredibly smooth skin. This is such a skin treat and if you like the more heavy feel of a body butter this is ideal for you. 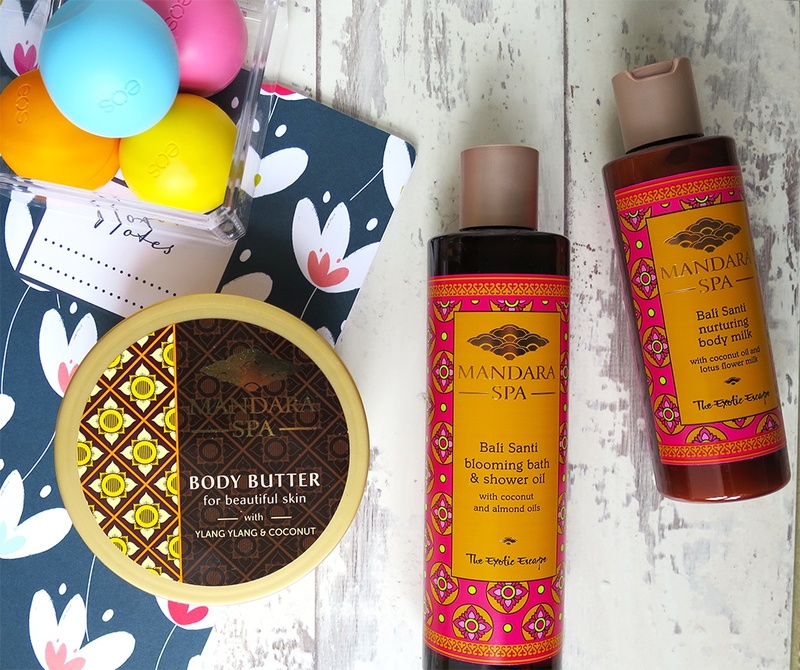 Mandara Spa products are budget friendly but that doesn’t mean they compromise on quality, they’re a very indulgent treat and I highly recommend them as gifts this Christmas. They have an extensive range of products and scents. I would say this range is an affordable luxury at its best.